Sharing insight between industry professionals and students is key to preparing the next generation of talented designers. Graphic designer Tom Hubbard, a graduate of the University of Leeds, was recently invited to speak to students about the creative process and his research into the factors that impact it. To complete his BA in Graphic and Communication Design, he developed the ‘Stacks’ project – an ambitious mission to complete 1,000 one-minute creative briefs in 24 hours. The intense endurance-style challenge was designed to investigate what issues can affect creativity and how these factors influence the quality of works produced over a long period of time. A high energy individual himself, Tom was inspired by previous studies he’d read about how adrenaline and memorable experiences could be used in design. He wanted to develop a situation in which he could measure his creative output under pressure and learn how to enhance it. 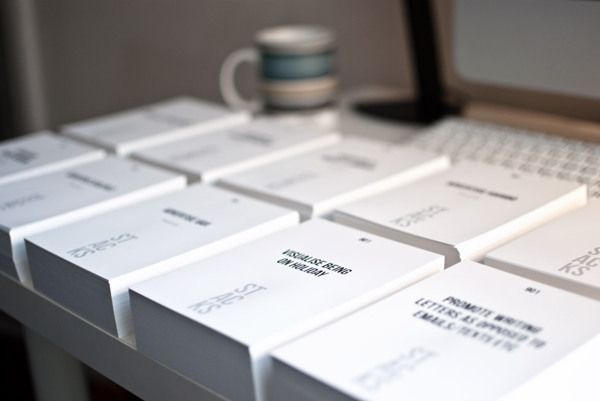 Before sitting down to complete the task, Tom prepared ten stacks of 100 pre-printed cards, each featuring a single creative brief such as ‘Rebrand a letting agency’ or ‘Advertise on Post-It notes’. He then had 60 seconds to produce a relevant idea or visual, all the while using different forms of rest, refreshment and types of music to encourage his creativity. Through this exercise, Tom gained an appreciation of the creative process and the energy expenditure needed to maintain a flow of fresh and innovative ideas. As he predicted, the originality of his ideas decreased significantly as he pushed himself over time. However, analysis of the data also revealed that – contrary to his preference of working with background noise – Tom found he actually worked better in silence. Additionally, the study suggested that taking a 15-30 minute break, which included eating and chatting with another person, had the most positive effect on his overall level of creativity. Following a discussion of his research, Tom talked about how he is applying his findings in an actual agency environment to increase his effectiveness. He also engaged in a candid Q&A session with students to help them understand the real-world scenarios that designers face when creating work for clients. By engaging with industry professionals like Tom, these young designers can get a glimpse of the challenges they’ll face in the future.